After the first round, all actions are available and players have the full complement of action cubes. Hopefully, you learned something about the ingredients in the first round. Now it's time to put that knowledge to use. A speed potion for a swift attack, a splash of poison to eliminate an enemy - adventurers need potions of all kinds and they know where to buy them. Selling potions is a good way to make a lot of money if you know what you're doing. Or a little money if you think you can fake it. At the beginning of each round (except the first) a new adventurer appears in town. The adventurer will be waiting here when it is time for you to sell a potion. The bottom part of the tile shows which potions the adventurer would like to buy. Note that this action requires 2 action cubes and you can use it only once per round. It is different in another way as well: You might not be playing in the usual order. We'll explain that in a bit. First, let's talk about what happens when it is your turn. When it is your turn to sell a potion, you must choose one of the three potions the adventurer wants. Your choice is limited by players who have acted ahead of you. In a 4-player game, you move one of your action cubes from the action space to the space below the potion you plan to sell. This blocks off that potion for those who play after you. Whether you successfully mix that potion or not, those who play after you will not be able to choose it. In a 3-player game, the adventurer will buy only two potions. If you are the first to sell a potion, you may choose any of the three. If you choose the third potion, you put a cube there and it is blocked off, leaving two for the second player to choose. 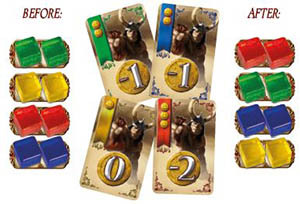 If you choose either of the first two, your cube blocks off both of the first two, and the second player to sell will have only the third option. Either way, only two players can sell a potion each round. In a 2-player game, only the first player can sell a potion. The space marked blocks off all three potions. The first player always has the option to sell any of the 3 potions. The maximum number of potions that can be sold is 1 less than the number of players. If you don't like your options when it is your turn, you can decline your action. If everyone declares this action, one player will be unable to sell a potion. This player must decline the action and move his or her cubes to the unused cubes space. When you sell a potion, does it have to be exactly the one the adventurer wanted? Of course not! You're an alchemist, not a perfectionist. But to keep your arms from being lopped off, you do need to offer a money-back guarantee. Exact match. You mixed the potion with the correct sign and correct color. Correct sign. You mixed a potion with the correct sign, but the wrong color. Neutral. You mixed the neutral potion. Wrong sign. You mixed a potion with the wrong sign. Color is unknown. When it is your turn to sell a potion, put your other action cube on the space next to one of these levels of quality. (Ignore other players' cubes. Multiple players can offer the same guarantee). You are guaranteeing you will make a potion that good or better, and you are charging the price shown on the same row as your cube. If you mix a potion worse than what you guaranteed, you don't get paid. If you mix a potion better than what you guaranteed, you get paid only for the level you guaranteed. "Trust me. It's worth it". You can charge 4 gold pieces for the exact-match guarantee. To get paid, you must mix a potion with the correct sign and correct color. "This should be just as good". You can charge 3 gold pieces for this guarantee. To get paid, you must mix a potion with the correct sign. (If you get the color correct, too, you still get paid only 3). "This amazing potion was made in an actual laboratory and is guaranteed to have no unwanted effects. I call it homeopathetic medicine". You can charge 2 gold pieces for this guarantee. You get paid as long as you don't mix a potion with the wrong sign. So the neutral potion also meets the terms of this guarantee. "I can absolutely guarantee that this is something in a bottle". You get paid. You can charge only 1 gold piece, but no matter what you mix, you get paid. Mixing a potion for an adventurer is similar to mixing a potion for an experiment. You set up 2 ingredient cards in your cauldron and tap the button. The card reader will display the six effective potions. Tap the one the adventurer wants you to make. (Even if you know your ingredients make a different potion, you still have to tap the potion you chose from the adventurer tile). When you scan the cards and tap , the card reader will not reveal what you mixed. It will just tell you how close you were by displaying one of the four levels of quality. Show your result to the other players. If you mixed or , then you know exactly which potion you made. Mark it on your results triangle and your player board with tokens, as you do when you perform an experiment. If you mixed then you know the sign of the potion and you know which color it wasn't. Take a bicolored ambiguous result token (like etc). and mark your results triangle. (You need not mark ambiguous results on your player board). If you mixed then you know only the sign. Take an uncolored ambiguous result token ( ) and mark your result. If you met the terms of your guarantee, take your money from the bank. Regardless of your guarantee, a result of or always causes you to lose 1 point of reputation. As usual, discard your two ingredients face down. You can make a little bit of money selling bad potions, but word gets around. If your reputation gets too low, adventurers will be reluctant to buy from you. All money shall be paid in advance and in the event that a known side effect accompanies the potion's declared effect I will not ask for nor be entitled to any compensation whatsoever. "Get yer potions heeere! Cheapest potions in town! Special discount today for men with large axes!" You've probably noticed that being first on this action space gives you an even bigger advantage than usual. And if everyone chooses this action, the last player doesn't get to sell a potion at all. So before the first player chooses the first potion, everyone has a chance to try to become the first player by offering a discount. Even though we explained all those other things first, offering a discount is actually the first thing that happens when it is time to deal with this action space. But if you are the only player on the action space, you skip the discount and go straight to selling. Each player has four bid cards with discount values of 0, -1, -2, and -3. If multiple players have declared a Sell Potion action, they all bid secretly by choosing one bid card and putting it face down on the table. When everyone has chosen, they reveal their bids simultaneously. Adventurers like bigger discounts. Each card has a certain number of smiley faces . Reorder everyone's cubes based on the smiley faces. Whoever has the most smiley faces gets to sell first. But the usual play order is still important. It is the tie breaker between players who offer the same number of smiley faces. Leave your card face up on the table until the action space is resolved. Your discount limits your choice of guarantee. When it is your turn to sell a potion, you cannot offer a guarantee whose discounted price would be zero or less. Example: Red played her -2 bid card. She can offer an exact-match guarantee at a price of 2 gold pieces. She can offer a correct-sign guarantee at a price of 1 gold piece. She cannot offer either of the two lowest guarantees. Even if Red is certain she cannot meet the terms of the correct sign guarantee, she can still offer it. (Maybe she wants to see if her two ingredients make a neutral potion. Or maybe she just wants to block that potion for those who play after her. Your reputation goes up and down during the course of the game. Check here for more information about the effects of repuration. Players on the Publish Theory action space play in the usual order. With each action, a player can either publish a new theory or endorse a theory that someone else has published. You can publish a theory about an ingredient when you know its alchemical. Or when you think you know. Or when you're sure no one else knows, either. It's up to you to decide whether to take a risk and publish early or to wait until you are certain. 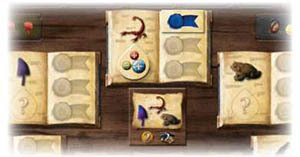 To publish a theory, pick up one of the alchemical tokens and place it on one of the books on the theory board. This is your public statement about the true identity of the ingredient depicted on that book. To mark it as yours, place one of your seals face down on any of the seal spaces. Now pay your publisher! You give 1 gold piece to the bank. What? You thought your publisher would pay you? No, friend. This is academics. Once you have published your theory, gain 1 point of reputation. If you look confident enough, no one realizes you might be wrong. Keep your seals face down in front of you or hidden behind your screen. When you put your seal on a theory, play it face down. Why all the secrecy? Because your seal is actually a secret bet on the accuracy of the theory. Your starred seals are for your sure bets. You have two goldstarred seals and three silver-starred seals. You save these for theories on which you would stake your life. Well, maybe not your life. But you are risking your reputation. Gold-starred seals earn you 5 victory points at the end of the game and silver-starred seals earn you 3, but only if the theory is correct. If the theory is wrong, you lose victory points. Or you can lose reputation points if someone debunks the theory during the game. The unstarred seals are for hedging against a certain aspect. This is represented by a question mark on a background of that color. If you are proven wrong about that aspect of the ingredient's alchemical, you suffer no penalty. (Only the color matters, not the size of the circle). On the other hand, unstarred seals are not worth anything at the end of the game. Unless a theory is debunked, its seals remain face down and secret until the end of the game. "Dear Colleague: If you are reading this letter it is because my Theory of Scorpion has been called into question. I would like it noted that I was always certain about its blue and green aspects. The red aspect, however, ..". You can publish a theory only about an ingredient that does not currently have an alchemical token on it. You can use only a token that is not currently assigned to any ingredient. The reason for this is simple: Each alchemical token corresponds to exactly 1 ingredient. Each ingredient corresponds to exactly 1 alchemical. So any other theory involving that alchemical or ingredient would contradict the published theory. Oh, you can try to tell the publisher that the other theory is wrong, but the publisher will not believe you. That other theory is published; yours is not. Clearly, the published theory is the more credible one. You may want to gnash your teeth and rip out your hair, but there is a better way to deal with such fools. You can unmask their incompetence next round. See Debunk Theory on the next page. Sometimes one of your colleagues publishes your theory before you do. It is unfortunate that someone else will get accolades for "discovering" something that was already obvious to you, but at least you can get some credit. To endorse a theory that someone else has published, put your seal on it, just as you do when you publish a theory. You can't endorse your own theory - there can never be two seals of the same color on a single theory. You must pay 1 gold piece to the bank. You also must pay 1 gold piece to every other player who already has his or her seal on that theory. "Of course you can be a co-author ... for a price". You gain no reputation for endorsing the theory. Except for that, your seal now counts just as much as anyone else's seal on that theory. Each theory has space for three seals. In a 2- or 3-player game, everyone can endorse the same theory. In a 4-player game, you cannot endorse a theory that already has three seals. Research societies are keenly interested in certain ingredients. So interested, in fact, that they are willing to offer you a grant for your studies. Of course, you must first prove that you know something about their field. In the middle of the theory board are 5 grant tiles. 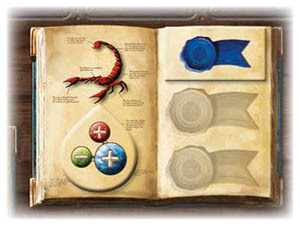 Each depicts 3 or 4 ingredients that you can study to win the grant. You win your first grant if you have seals on theories about 2 of the ingredients depicted on a grant tile. (It doesn't matter whether these seals represent original publications or endorsements, and it doesn't matter whether the seals are starred or unstarred). Blue has published a theory of scorpions. If he can publish or endorse a theory about either toads or mushrooms, he will win this grant immediately. When you win a grant, immediately take the tile and put it on your board face down. You immediately take 2 gold pieces from the bank. Each grant will also be worth 1 or 2 victory points at the end of the game. The gold pieces are intended to further the scientific cause. You should only spend money on expenses that the grant committee would approve of. ... Ha ha! Just kidding. Most alchemists spend all their grant money on a shiny new artifact. If anyone asks, you can say it's "an essential piece of lab equipment enabling cutting-edge research". Once you have a grant, no one else can take it. It will be yours for the rest of the game. Even if one of your theories is debunked, you will not have to give up the tile and you will not have to give back the money. After your first grant, you can get more grants only by having seals on all 3 of the ingredients depicted (or 3 of the 4, in the case of the middle grant tile). This is the meaning of the "3" on the back of your first tile. If you make a single publication or endorsement that qualifies you for 2 first grants at once, choose 1 of them to be your first grant. You will need seals on three ingredients to qualify for your second grant. Of course, any theory bearing an alchemist's official seal is assumed to be a correct theory. But some theories are more correct than others. Technically, this action is available in the second round, but you won't be able to use it until a theory has been published. If you prove a theory is wrong, you gain 2 points of reputation. Of course, anyone with a seal on that theory is at risk of losing reputation. Details are below. If you are playing your first game, you can skip the master debunking rules for now. They will make more sense once you have practiced apprentice debunking. The app's debunking action works differently depending on the variant you are playing. If you discover you have it set to the wrong variant, go back to the main menu and change the setting. Tap and set the card reader on the table where everyone can see it. The card reader will display the 8 ingredients and the 3 aspects. Debunking does not use the ingredient cards in your hand. To debunk a theory, you just need to show that one of the aspects is wrong. Tap the ingredient of the theory you are trying to debunk. Tap the aspect you are hoping to prove wrong. Then tap . The card reader will show everyone the sign of that aspect of that ingredient. Compare it with the alchemical token on that theory. If the sign on the screen matches the sign of that aspect on the token, you have failed to debunk the theory. (That doesn't mean it's correct. It just means you have failed to prove it is incorrect). You lose 1 point of reputation for wasting your colleagues' time. If the sign on the screen is the opposite of the sign of that aspect on the token, you have debunked the theory. In either case, everyone now knows the sign of that aspect for that ingredient. They can mark that information in their deduction grid. When using this action, you are not allowed to choose an ingredient that doesn't have a published theory. Read here more information about debunking. In the master variant, it is not enough to know which aspect is wrong, you have to know an experiment that proves that aspect is wrong. Tap and set the card reader where everyone can see it. It will display the 8 ingredients. Debunking does not use the ingredient cards in your hand. The card reader will say that those 2 ingredients do indeed produce the potion you selected. The card reader will say that they do not produce the potion you selected. Explain which outcome will debunk a theory or demonstrate a new conflict between two theories (as described below). Once everyone understands your explanation, tap . If your experiment does not debunk a theory or at least demonstrate a new conflict, you lose 1 point of reputation for wasting the scientific community's time. If you debunk a theory, that counts as success and you gain 2 points of reputation. In master debunking, it is possible to demonstrate a conflict without actually debunking a particular theory, and that is also worth 2 points. The most common case is the simplest. You show that one aspect of one ingredient is the opposite of what has been published. You gain 2 points and everyone with a seal there is at risk of losing points, as explained in the Consequences of Debunking box. If you are learning master debunking, you can skip the rest of the Master Debunking section and go play the game now. All your debunking actions will probably be this type. If something weird happens in debunking, you can come back and read the rest of this section. If the board has theories for both ingredients in your demonstration, it may be possible to debunk them both simultaneously. If you show they both have an aspect that is the opposite of what their theories claim, they are both debunked. When you debunk two theories, reveal all the seals on both theories and add up the penalties for both. (If a player loses 10 points, count it as one loss of 10, not two losses of 5). Your reward for a successful debunking attempt is still only 2 points, even though you debunked two at once. You get the option of one immediate publication, not two. Sometimes your demonstration shows that one of two theories must be wrong, but it doesn't show which one is wrong. Whenever you demonstrate a new conflict between two theories on the board, it counts as success and you gain 2 points of reputation. No one loses points, however, because it is not clear which theory is wrong. You don't have the option of immediate publication. When 2 theories are demonstrated to be in conflict, mark them with matching conflict tokens. The seals and alchemical tokens remain on the theories, but the seals no longer count for conferences, grants, and the top alchemist award. (See page 16 for details). No one can endorse a theory that is in conflict. Conflict tokens have no effect during victory point scoring at the end of the game. Theories in conflict may be used in debunking attempts. If either theory is debunked, remove both conflict tokens from the board. The other theory is a normal theory once again. (Even though it might be wrong). be able to demonstrate a new two-theory conflict, as described above. If your selection can do neither of those things, you should hit the button and rethink your demonstration. If you perform a demonstration that does neither of these things, it is a failed debunking attempt and you lose 1 point of reputation. When you demonstrate a two-theory conflict, it must be a new conflict. If you demonstrate a conflict that is already denoted by a pair of conflict tokens, that is not a valid debunking attempt and it will cost you 1 point of reputation. However, you can use a theory under a conflict token in a demonstration of a different conflict.